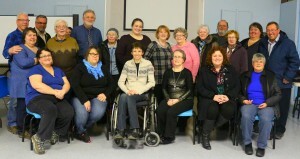 Last evening, February 26, 2016, the GHHS held its 2015 AGM and welcomed about 30 people to hear Grant Genova and Kathi Stacey speak about heritage in rural Newfoundland Labrador. Special thanks to members of the Hants Harbour Willow Tree Heritage Society for coming up the shore on a dark wet night. We appreciate your being there. MHA Sherry Gambin-Walsh also took the time out of her very busy schedule to attend. Thank you for the support and we look forward to your continued support and interest. GHHS president, Nancy Brace, welcomed the group and gave the president’s report. She told everyone that the building has been paid for, roof paid for, land surveyed, deeded and registered, and the Star of the East rebuilt. She also said that the eight arched windows are out being rebuilt now and will be paid for by families in memory of family memories or in honour of family names. She reported that at last year’s AGM, the GHHS was $500 away from being debt-free and this year there is money in the bank. GHHS treasurer, Mary Green, gave the financial report which was prepared by Nigel Cose CPA. The GHHS is well on its way to having the money to start more renovations. Kathi gave a slideshow presentation informing everyone about the role of Legendary Coast DMO in our area, the goals of Tourism and the role that heritage plays in the tourism economy. Grant talked about the changing landscapes and skylines of rural Newfoundland as we lose more and more of our older buildings, our churches and fishing industry buildings. He warned of the changes that are happening in rural Newfoundland where new builds are required to be in square lots with the front door facing the road….. more of a suburban layout…. will kill the traditional higgly piggly layout of our towns and communities. He said that development in this manner will kill the very thing that is advertised about us in tourism ads. There was some lively discussion about the fate of the Anglican Church building in Green’s Harbour and it was decided that a sub-committee would be formed to continue this work. After the meeting there was a small social with tea and coffee and sweets. We thank everyone for the attendance and involvement. Many of the people who gathered for the GHHS AGM for the year 2015.